Aksum. The morning after our day in Lalibela, we hopped a short flight to Aksum. 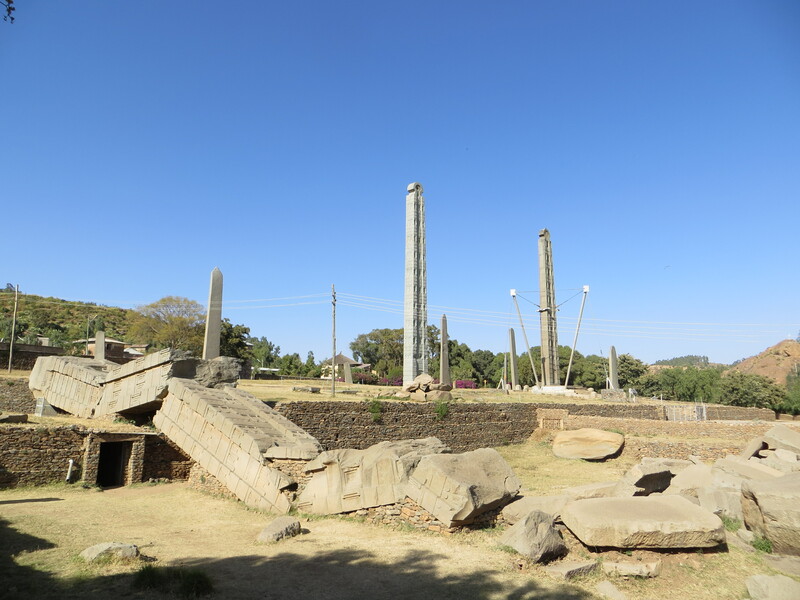 Aksum was one of the biggest surprises for me on the trip. All I knew (or all that I really heard maybe…hey, I’ve got selective hearing sometimes too) is that we were going to see some stelae (or obelisks) – which, after having seen some speckled throughout Spain, fascinate C but leave me bewildered (translation: yawning) and thinking they just look like, well, big phallic symbols. The ones in Aksum were totally different. They date back to the 3rd and 4th century, range from 1 to 33 meters in height, and lie on a field of tombs only very partially excavated – meaning most archeologists believe you are basically walking around on top of a field of real, honest-to-goodness treasure. COOL. In fact our guide told us that is the case practically throughout the entire town, that there is a world waiting to be discovered at every turn. Sorta made me want to grab a shovel, ya know? Our first stop was to see the excavated palace of Queen of Sheba, dating back to 3,000 BC. Apparently she was quite the lady. Wild, right? The stelae field. The tallest one toppled, they just weren’t set up deep enough or with enough balance to stay up forever. You can see some of the others have support. Our guide here was awesome. All our guides were great really, but he not only knew a ton, he also walked us through the market, took us to a very local place for lunch, and showed us what felt like a very insider view of the city. One of the market vendors. Few things say more about the way a city works than its market. We always go no matter where we are. Another market shot. 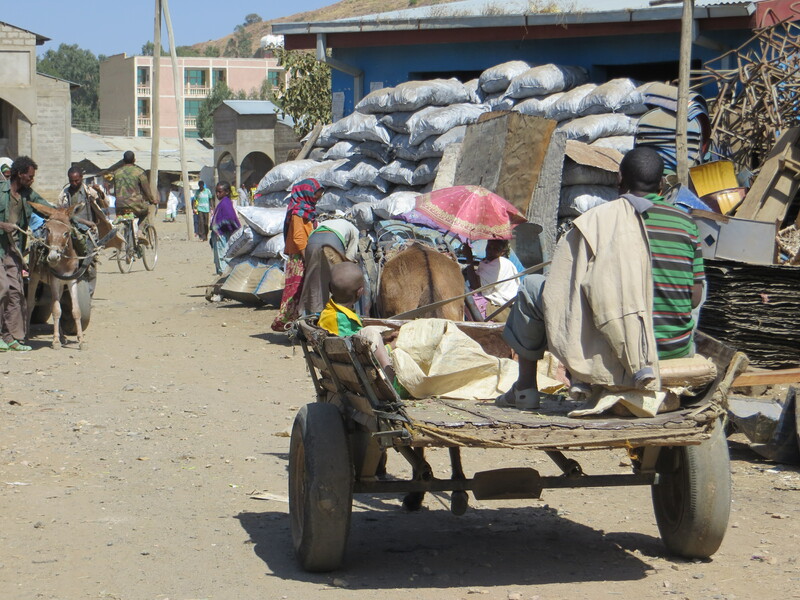 Mules are a STAPLE in Ethiopia. 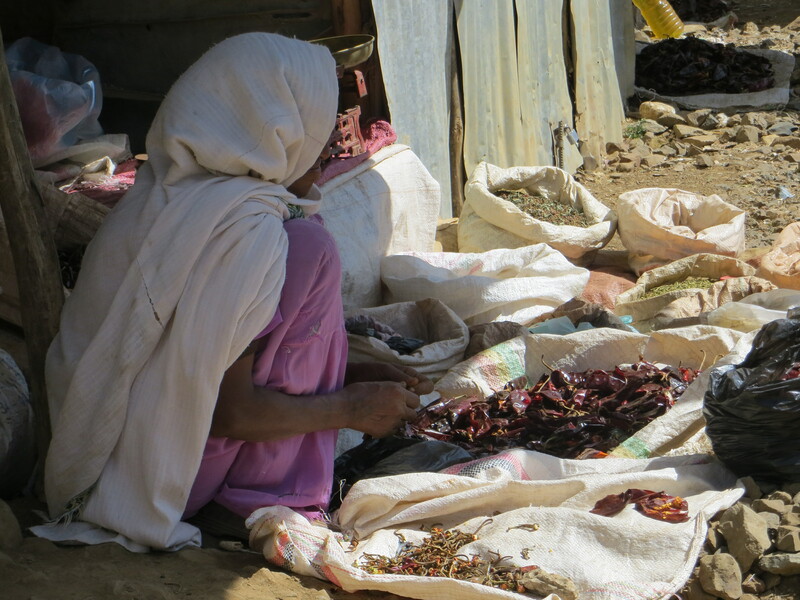 Lunch, Ethiopian style. 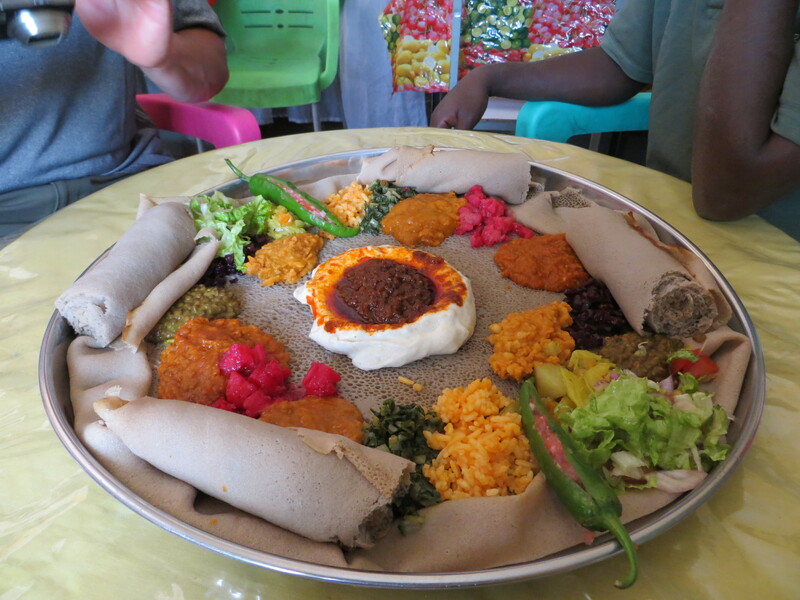 This is how they serve injera – the teff based pancake like “bread” – on a big plate for sharing, topped with little mounds of different things. They were in a period of fasting when we were there – 40 days before their Christmas celebration, called Timket, on January 17. So these are all veggie based. Looks odd, but was REALLY good. Yum. 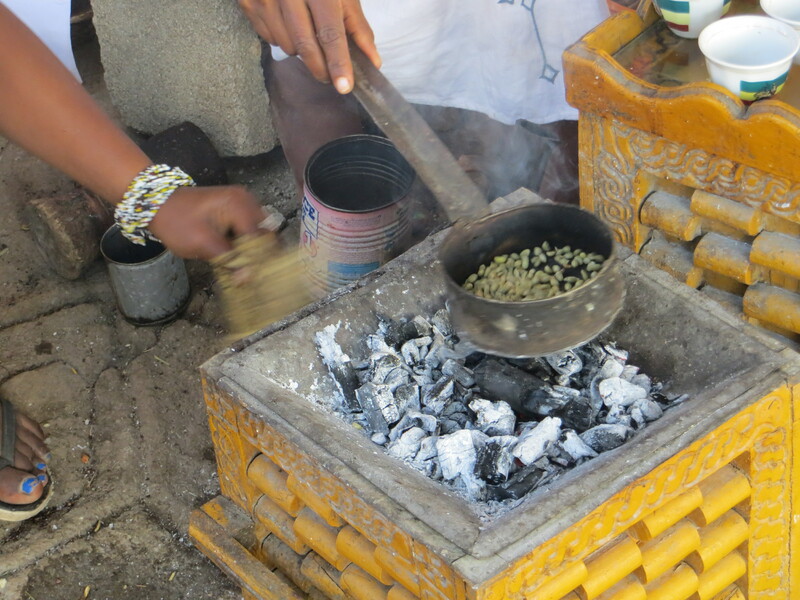 Ethiopians are very proud of their coffee, and coffee rituals. The way they make it is pretty cool, and we stopped for some nearby the stelae. They start with the green coffee beans (yeah, I didn’t know they were green to start either), roast them in a little pan – which is when they start to smell and look like the coffee beans we are all used to seeing, grind the beans by hand with a big mortar and pestle, then begin the process of adding water and boiling and mixing until it turns into coffee. It is a bit thicker and stronger than most coffee drinkers, but it is less bitter and actually has a very good taste. And no, they don’t drink it with milk. Roasting the beans. And that other hand is fanning the fire. Starbucks Shmarbucks. After a great day and a really nice evening having dinner at a restaurant owned by the nicest couple, an American man and his wife who was Ethiopian (interesting to get the perspective of a US Military dude from Virginia Beach living in Aksum! ), the next morning we hopped on a flight to Gonder, dropped our non-camping stuff off at our hotel, and made our way straight to the mountains. 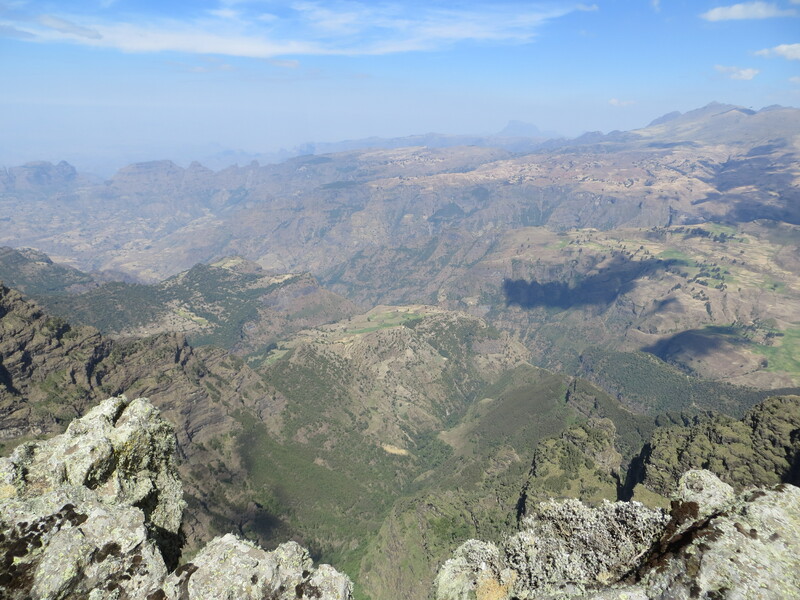 Simien Mountains. 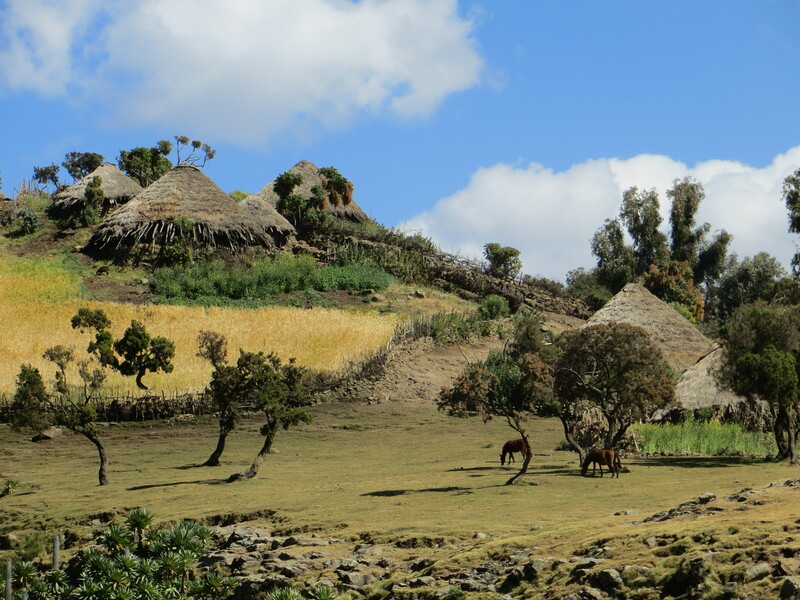 The park itself is a World Heritage site (BTW, notice a theme here…we saw ALL of Ethiopia’s UNESCO sites!) 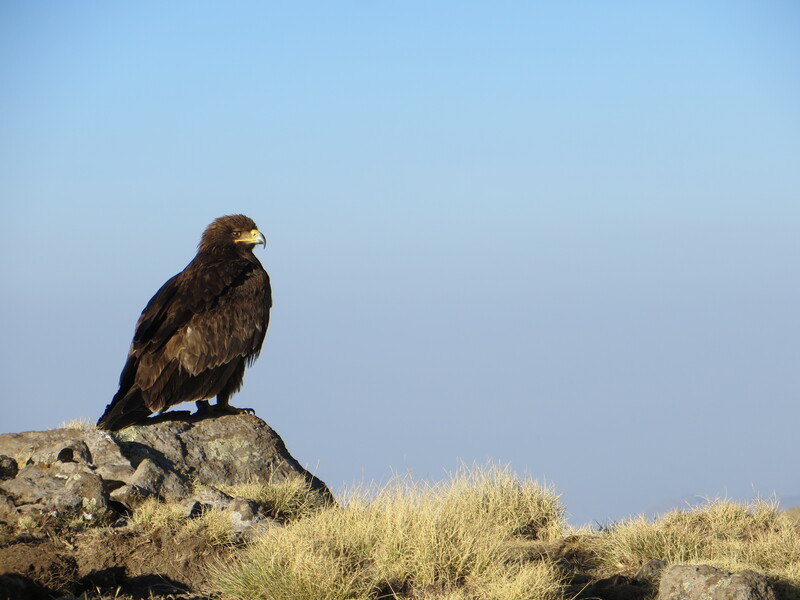 and is one of Africa’s principal mountain ranges. It was an adventure. To go to the mountains, you are required to have a guide and a scout (a guy who carries an AK-47 or something along those lines). In our case, we also had a cook and two mule drivers, though they didn’t walk with us. They carried all the stuff we didn’t need during the day, the tents, food, etc., and met us at camp each day. We started our journey in Gonder, picked up our cook and headed to Debark to get our park licenses and pick up our guide and scout. So, off we went…all seven of us, in a not-so-new 4X4 vehicle bouncing along those gravel roads I mentioned until….OOPS…that axle came out. Like I mentioned in Part I, the driver tried unsuccessfully to fix it, so we ended up losing some time to that and eventually waiting for a new car, and arrived up at camp at dark. Bright and early the next morning, we set out for a 15k hike. Our guide was like a little Morgan Freeman – his name was Get and he had been a guide for 20 years. He was FABulous. Knew every plant, bird, animal, where to stop to look for things – plus was an excellent judge of our (translation: MY) capabilities and pace, even better than I was of my own. More on that in a sec. We hiked, climbing from about 11,000 to 12,000 feet. It was gorgeous. And considering that’s not my normal elevation (snort), I wasn’t sure how I’d respond. Turns out I made it through the day brilliantly and then suddenly at night, I turned into little Miss Pukey Pants. OOOPS. The next day – feeling pretty much like dookie birds – we did 20km+ more. I had a terrible time catching my breath, didn’t want to eat, and basically decided an hour into the hike that I would rather live the rest of my life without teeth and eyebrows than continue. BUT dear, sweet, darling Get gauged me better…and even threw out the “well, if you really can’t go any farther, we can always get a horse.” Over. My. Dead. Body. So, the long and short of it was that I made it, SO glad I did, and overall, we really had an amazing three nights in the mountains. I’ll try and put some details into the story with some pics, so here ya go. 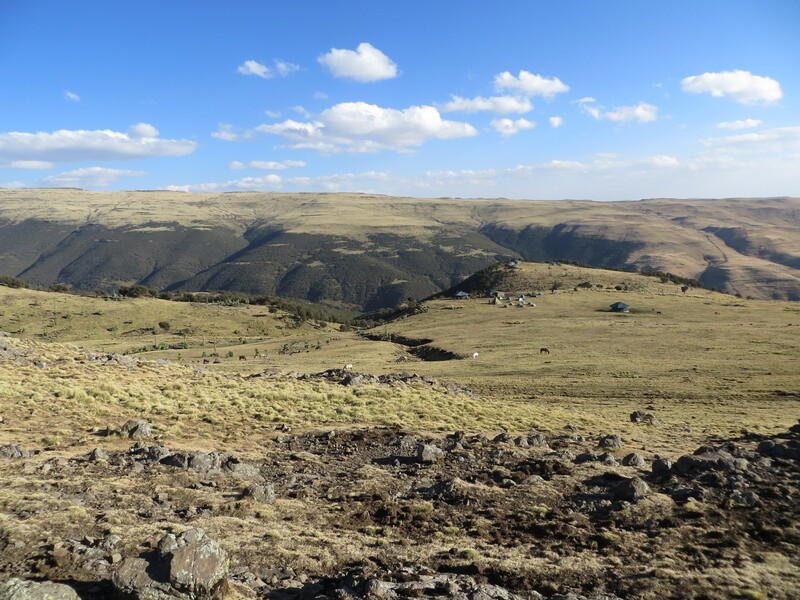 Our scout on the right, some children from mountain villages, and the spectacular scenery. A mountain village we passed through. Camp, in the distance…we took a bit of a walk for a cool view after we got in that day. This eagle was amazing. We got so close and he didn’t even budge. C and Get on the lookout for wildlife. From our highest point of just about 14,000 feet. 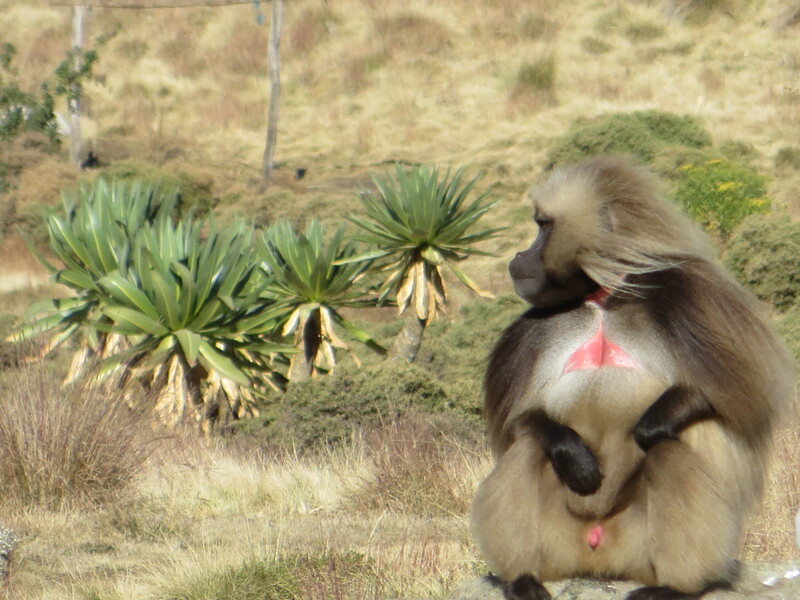 There are between 5,000 – 6,000 Gelada monkeys in the park. They are awesome. They are also called lion monkeys because when they run, the the wind blows their hair and they look just like lions. It’s worth a chuckle to say that on our way back from the mountains, I prayed like 50% (okay fine, 80%) of the time. Our driver was tearing up and down these cliff edge roads, bumpy and gravelly and dusty, and all I could think was thank heavens my mother doesn’t know where I am right this moment. Holy Mary Mother of God. AND? And we got another flat on the way down. 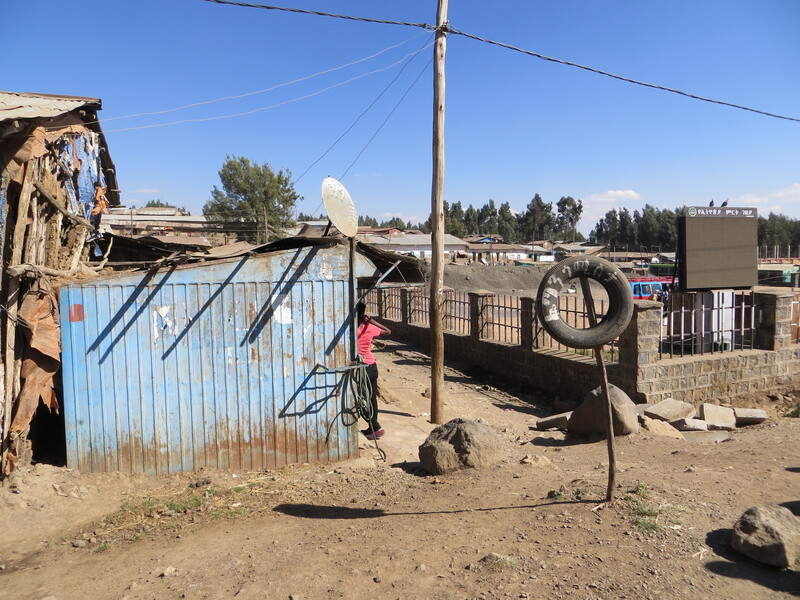 We had to stop at the “tire store” to change it on the way back to Gonder. Yep, that’s the tire store. So, overall our mountain experience was nothing short of stellar. Covered head to toe in dust, and most certainly smelling like the four days we had gone unshowered, we made it back to Gonder for a whirlwind tour. 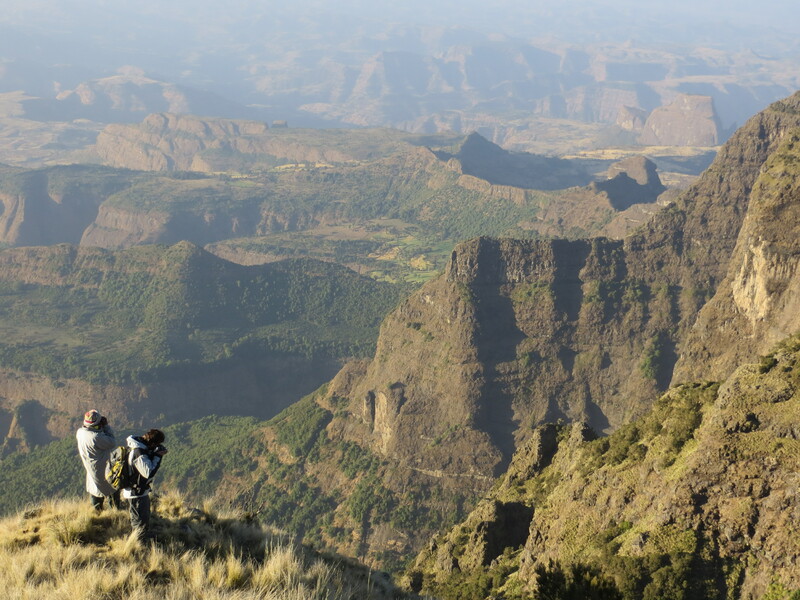 This entry was posted in Uncategorized and tagged Aksum, Ethiopia, Simien Mountains, travel. Bookmark the permalink.